Kathmandu, a dusty town in a valley, is split into 3 areas which were separately governed before: Kathmandu, Patan and Bhaktapur. The town is rich in history, culture and art and the architecture which still stands post-earthquake is a beautiful example of Nepal’s woodworking culture. Complex brick based buildings are framed and finished with intricately carved wood lattice on windows and doors, and within the courtyards and foyers. Within old fashioned homes, seats and beds are set next to windows and boxed off from the rest of the room with their own complex lattice woodwork. 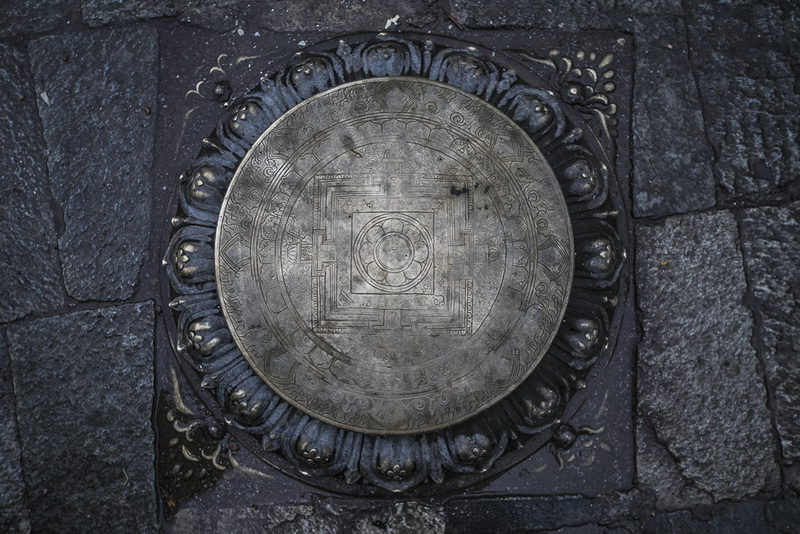 Walking around Patan’s Durbar square, one is totally surrounded by beautiful examples of typical architecture. Most of the buildings are propped up with wood or steel trusses whilst they await stabilisation and repair post 2015 earthquake damage. Nevertheless, walking around the narrow alleys, looking up at the complex roof structures and exposed wooden framing, it really feels like a unique space. The earthquake took a heavy toll on the town with roads being dug up to fix the sanitation infrastructure, still in disrepair two years after the event. Some temples are mere piles of bricks, with only clues as to their previous grandeur. Still, the people are happy and warm and welcoming. Regardless of where we walked we were greeted with a cheerful “Namaste!” it lent a positive and friendly atmosphere to the crumbling beauty and majesty of the city. 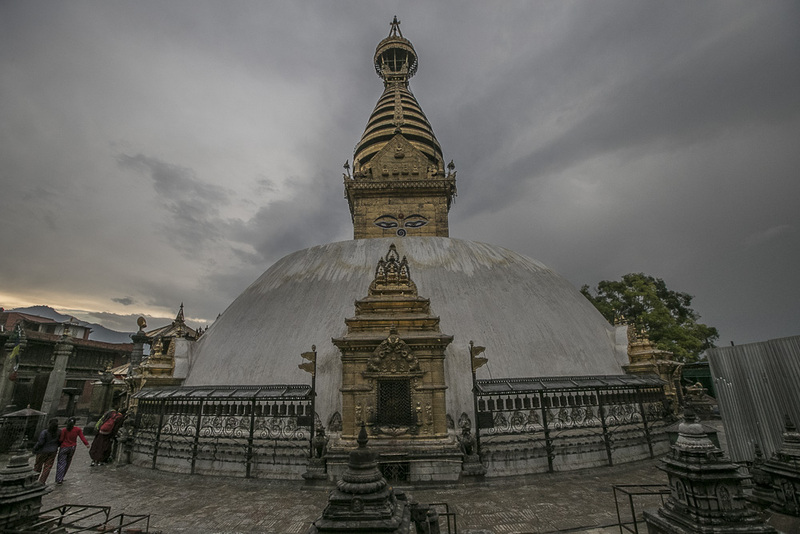 To the west of Kathandu there is a huge Stupa, commonly referred to as the Monkey Temple, Swayambunath. 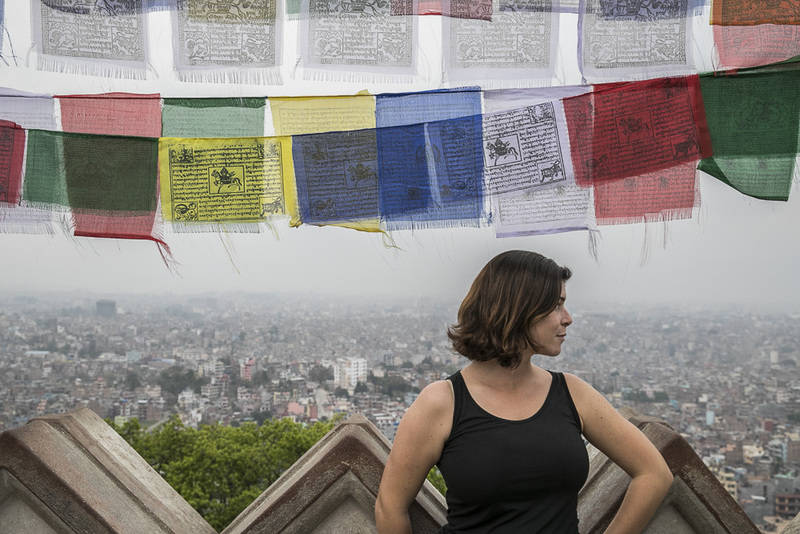 We walked up the short hill to the stupa site, monkeys swung on prayer flags, trying to race us up the stairs. They almost won but the competition was just too much and three jumped on the same flag at once and ended up all tumbling back down the hill. Dogs guarded the small Stupa at the base of the hill. 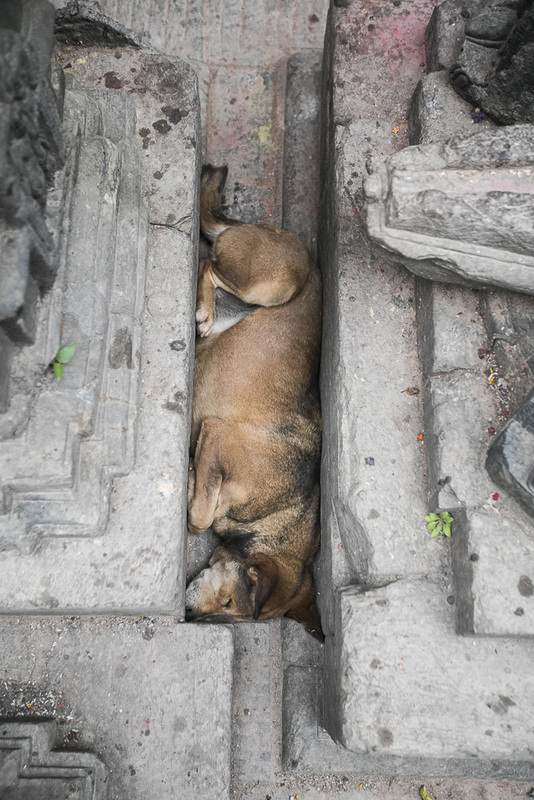 We’d noticed that there were quite a few strays in Nepal but the difference between these and those we’d seen in SE Asia were that they were happy, fed and clearly cared for. 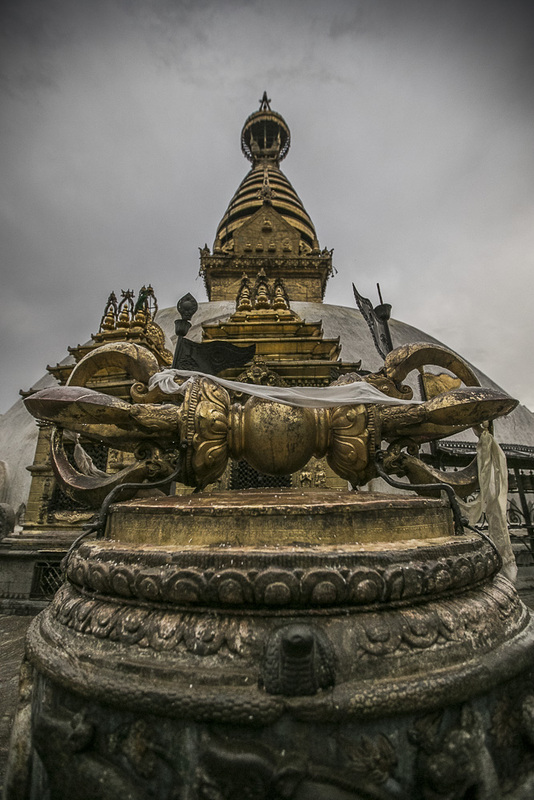 The short walk up the hill revealed the full Stupa at the peak. 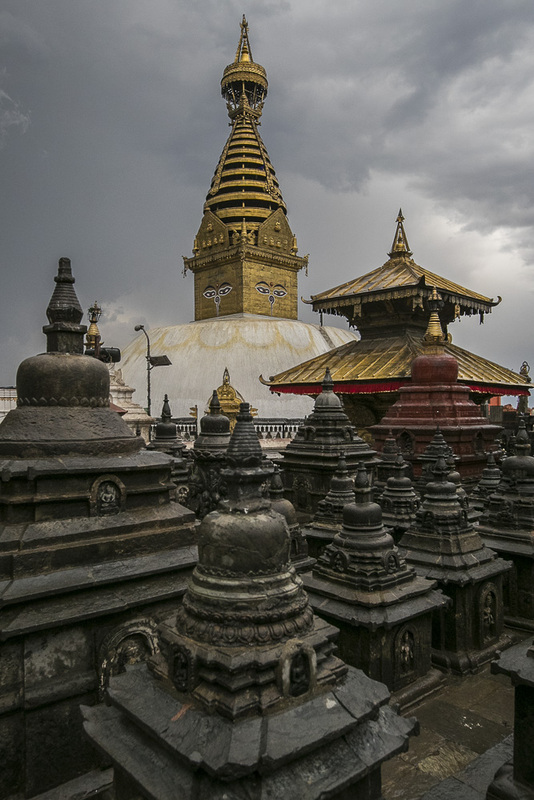 It really was beautiful, rising above smaller carved stupas and the gold framed against the stormy clouds was like a beacon across the city. 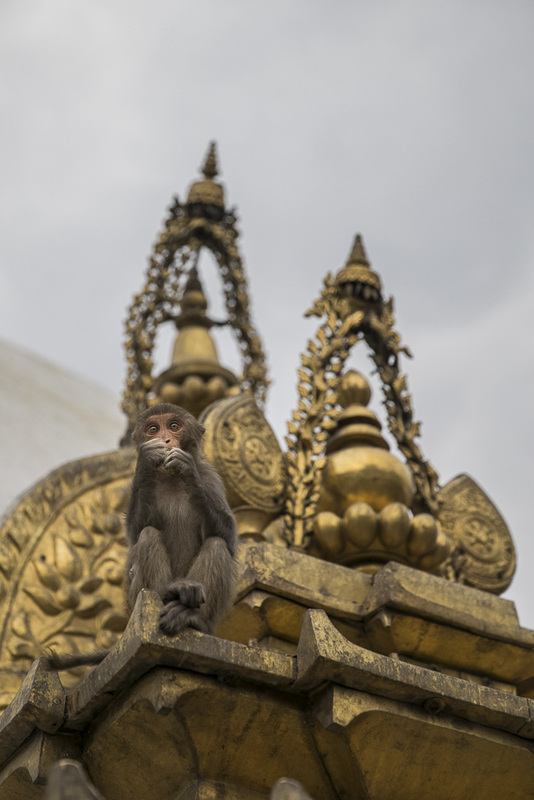 Monkeys were everywhere, they seemed to be skipping across roofs and eating all the offerings left by worshippers. They’d squeak and whoop when they found a fresh and tasty offering and then fight over the morsels! 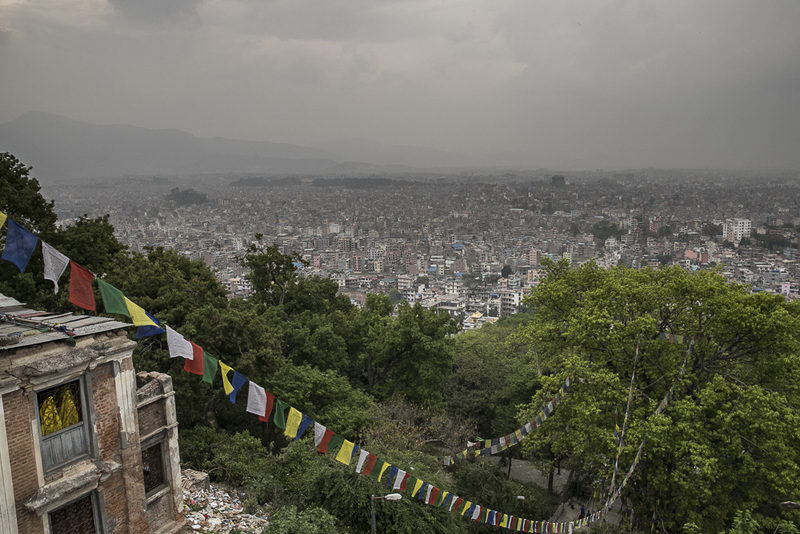 A storm was brewing over Kathmandu when we visited but it didn’t detract from the view. The amount of dust was pretty clear at that point as we were above the buildings, a haze was visible hanging over the city. It had only been a couple of days but we’d already developed a cough from the air. It became abundantly clear why a lot of locals wear facemasks and in fact, a lot of street sellers make a living from selling fancy masks, in different colours and styles for your breathing needs. The Stupa complex was full of little treasures, dogs sleeping in tiny crevices, architectural plans of the Stupa engraved into the ground. Dorjes and prayer flags uncovered with every circle of the stupa. The rain soon came and scared us off and we waited under a roof with the monkeys. Cosy napping spot, monkey free! During our timed in Kathmandu, we were staying with a friend who lives there and works as a sustainable architect- we received the warmest welcome possible. On our arrival, we were invited to tag along to a party with his friends. Simon was really excited as he hadn’t been to a late night party since our leaving party in July. It was a special night, on a rooftop in Patan, overlooking the city and drinking under the stars. Simon was particularly impressed by the fact that a Polish drinker could be out-drunk by a Newari. Strong livers, must be the altitude training. All this drinking had to be balanced out with food and we tried Newari cusine, a snack comprised of flattened rice, smokey braised buffalo, fermented radish leaves and a veg curry. In the evening we were treated to buffalo brains, tongue and intestine served with a gram flour pancake and some fried potatoes. 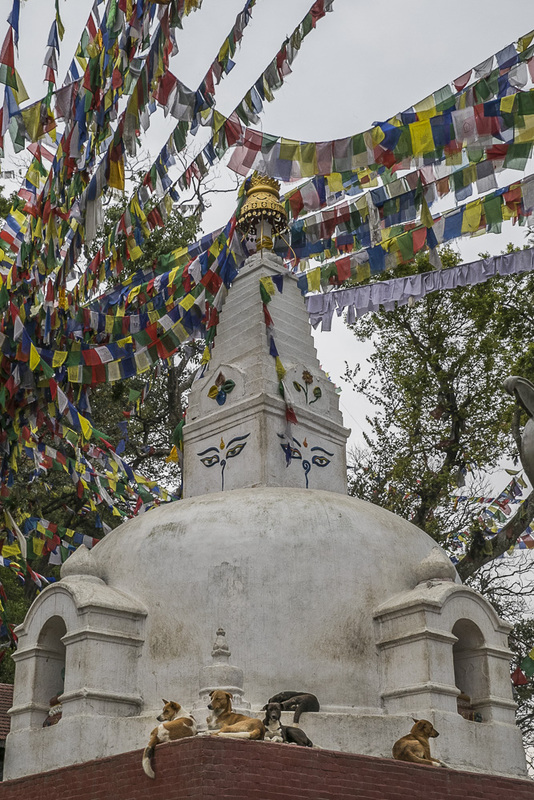 This was a fine introduction to the city and we were looking forward to exploring more on our return from Everest Base Camp in the Khumbu national park. We were all set to catch our flight to Lukla, the world’s most dangerous airport and trek the 10 days up to Everest, or Chomolungma, Goddess of the Valley to most Tibetans and Sherpas.